A few years ago, in a 2013 article on MarketWatch, I predicted that by early in the next decade, the United States would no longer need imported oil from OPEC. I was in no uncertain terms told I was wrong by many pundits and commentators, as well as, flat out laughed at. The rapid improvements in solar energy, wind power, batteries, electric vehicles, hybrid vehicles, building efficiency and drilling technology, has in fact put the United States on the path I laid out just 4 years ago. That “all of the above” approach, so long as it is not disrupted by politics, will lead the U.S. to not needing OPEC oil imports by the mid 2020s. Since peaking just before the financial crisis, U.S. imports of oil from OPEC have been declining until a small uptick in 2016. The recent uptick in OPEC imports is largely due to the extremely low oil prices brought on by OPEC’s grab for market share. 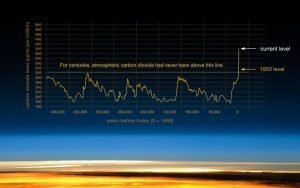 That uptick has leveled off in 2017. 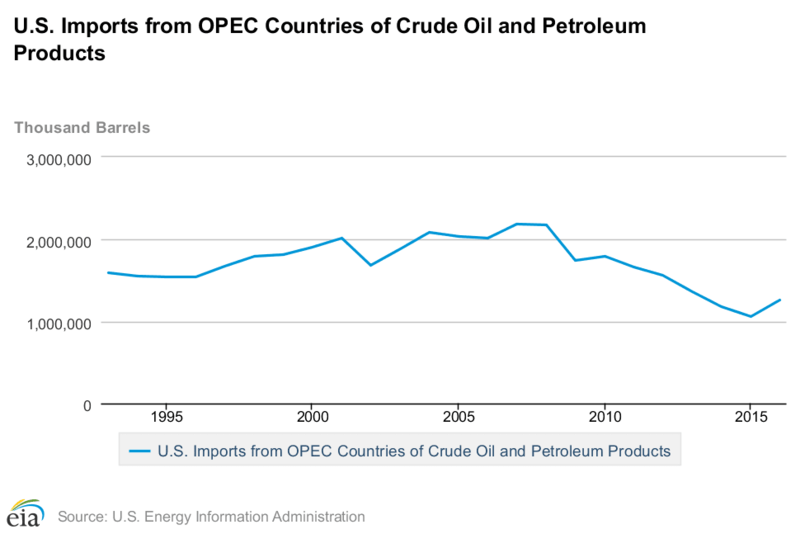 Over the past decade, U.S. imports of OPEC petroleum are already down 42% from peak. Reduced imports of OPEC petroleum coincide with a few different events. 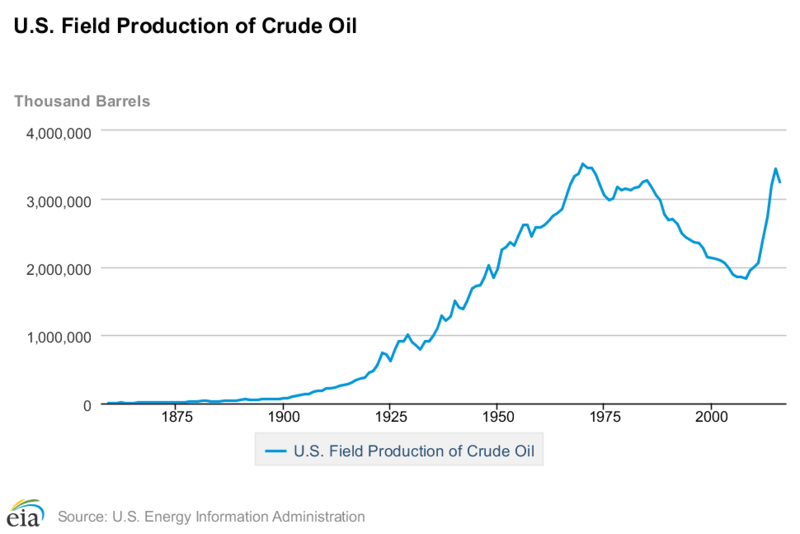 The first is the surge of domestically produced oil from U.S. shale. American production of oil has risen from about 5.1 million barrels per day in 2008 to about 9.3 million barrels per day today. 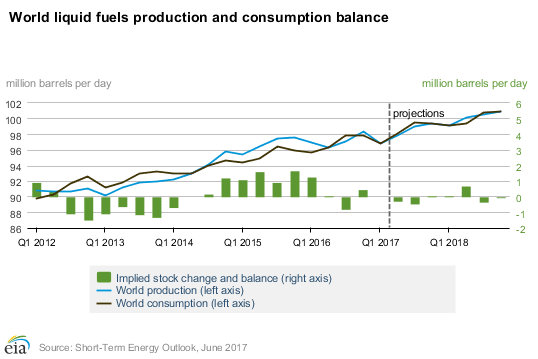 The trend for U.S. production is slowly moving up after a setback due to financing issues in 2015 and 2016 resulting from the OPEC actions to flood the market with oil. Projections are for the U.S. to be producing 10 million barrels of oil per day in 2018 and then likely approaching 12mbd from the early through mid 2020s. Around the mid 2020s, it is likely for a number of reasons, the key factors being depleting oil fields and less investment in offshore deep water than in the past, that U.S. production starts to fall. While that could hinder America’s attempt to be free of OPEC oil imports, that is also about the time that electric vehicles and hybrid vehicles, in addition to more efficient gasoline powered vehicles, will start to dominate new car sales. Recently, increased fuel economy of gasoline fueled vehicles has been a major contributor to needing less OPEC oil. Rules passed under President Obama have led to U.S. light duty vehicles to having increased fuel economy by 5mpg from 20mpg in 2007 to a shade over 25mpg today according to the University of Michigan. The Trump administration is currently considering partially reducing the penalties on carmakers for missing fuel efficiency standards. Their actions on inflation adjustments in the fuel efficiency standards will have an impact on whether we can truly be free of OPEC. The last important item for the United States declining dependency on OPEC has been the impact of a slower rate of growth for miles driven in the United States. The financial crisis clearly had a role in this as unemployment was high and that drove miles driven down as too many people did not have work to go to. 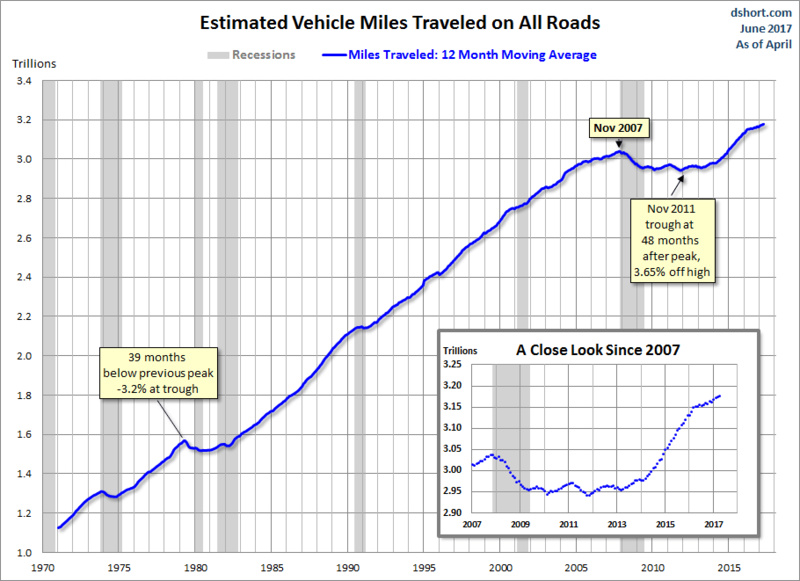 Growth in miles driven did return during the past three years however. A growing economy will lead to increased miles driven, however, not at the pace we saw in from 1970 to 2007, as many jobs are now remote (from home), ride sharing is gaining ground and millennial household formation has been more urban than suburban. After a surge in miles driven in 2015 and 2016, the upward curve appears to be dramatically moderating in 2017. There is also a risk of recession that would put downward pressure on miles driven. In the United States, the demand for oil revolves primarily around transportation. According to the EIA, about half of all oil is consumed for personal automobiles and light vehicles. Another quarter of U.S. oil is used for heavy transportation, including air travel. Most of the balance is used for heating fuels, power generation and plastics. If the future of automobiles is in electric vehicles and hybrid vehicles, then the demand for OPEC’s oil would fall substantially in two phases. The first phase would be the transition of new car sales from gasoline powered vehicles to EVs and hybrids. The second steeper dive would be 10–20 years after new car sales switched predominantly to EVs and hybrids as the majority of gasoline powered cars are retired in the 2030s and 2040s. The case for electric vehicles and hybrids is growing rapidly each year. Technology improvements are that dramatic. The electric vehicle producer that most people know is Tesla (TSLA). President Trump called Tesla’s CEO and Chairman Elon Musk “a force of nature.” Tesla’s Model 3 electric vehicle for the mass market is just going into production. It is the company’s first car with prices starting at $35,000 and averaging around $40,000. 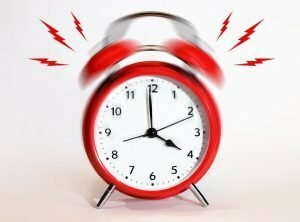 There have been over 300,000 pre-order reservations with $1000 deposits. So far, fewer than 10% of pre-orders have been canceled. For comparison, the Model 3 will be starting off as about the 15th most popular car by sales in America. No other EV or hybrid comes close to Tesla’s sales in America, although that might change soon. Toyota ™ with its iconic Prius is coming to market with new models and also rolling out a hybrid Toyota Camry at about $30,000. The Camry hybrid is behind the Tesla’s technologically but the price gap might make up for that. The Camry is bigger and gets about 50mpg city and highway on average. I would expect that Toyota, with much of it motor technology having been shared from Tesla, will become a major force in EVs and hybrids as they emphasize that market more. BMW (BMWYY) is yet another entrant into EVs and a good one. Their i3 model is nothing short of breathtaking. I had the pleasure of riding with a friend and the car is amazing. It is expensive as you’d expect a BMW to be, but it’s a luxurious small car and just plain fun, if not completely utilitarian. General Motors (GM) is also in the game with the Bolt and the Volt which are both very good cars and priced under $40,000. Ford (F), not to be left out has both hybrid and EV models. Ford has announced a major retooling for the early 2020s push into EVs and hybrids, promising to be cutting edge. I think that it is the beginning of the end for gas-powered cars. The question is how long does it take for the ending to end? That’s a much more difficult question to answer. Here, I’d refer people to an article on Seeking Alpha that I think has it wrong. The article is “Will Fuel Efficient Vehicles Decimate Oil Demand?” I believe the author falls into a trap of using a common narrative from people who don’t want less oil to be used over time. That’s an easy trap to fall into given the political nature of oil and the motivations of traders. The author concludes “that world oil demand will exceed current levels by a significant amount in 2030 (first case) even if huge efficiency gains can be made and implemented.” I do not agree, but you should read his arguments so you no the other side of the coin. There is no way to have a data driven approach to making my case on EVs and hybrids other than to consider the adoption rates of other breakthrough technology products. Yes, we should look as the evolution of cars as technology breakthroughs. Let’s take a look at the adoption rate of smartphones for a clue on what the adoption rate of EVs and hybrids might look like as technology brings prices down and performance up. 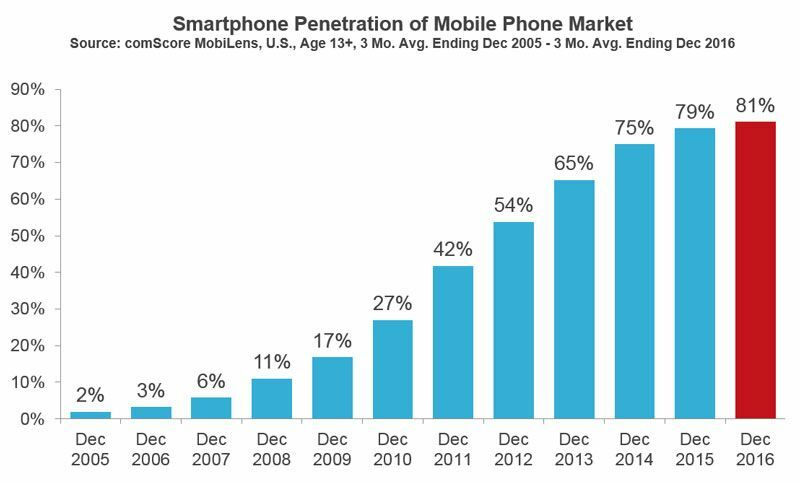 As you can see, it only took a little over a decade for smartphones to be ubiquitous in the United States. 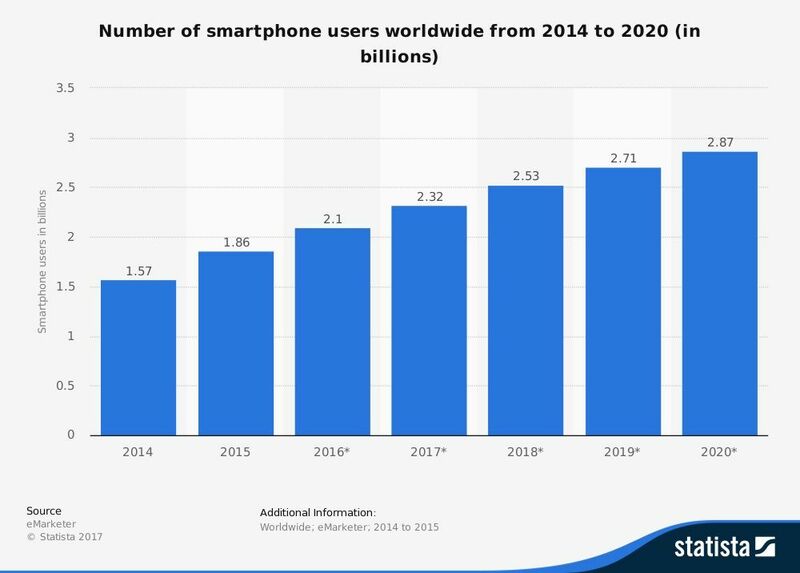 Globally the growth of smartphones is nearly as impressive when you consider many of the people are in emerging markets and were not “switching” from landlines as smartphones were their first telephones. So, let’s consider this. 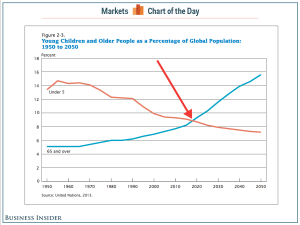 There are billions of people without cars right now and they are steadily becoming middle class around the world. That means many will want cars. China is a prime example of this. New car sales in 2016 in China were over 28 million vehicles. Many of those cars were “small-engine” vehicles because the government steered demand through tax incentives. Neither China, nor India is energy self-sufficient. They are not going to want to import a lot of oil as it will be a massive cost on their economies. India has already announced that all cars sold would be electrics by 2030. I suspect they back off a bit to include hybrids, but the point is made. In China, they are building six big factories to build batteries for smaller EVs. It is not beyond the scope of reasonable speculation to think that China would declare no more pure gasoline powered cars in the next decade. Tesla is also rumored to be negotiating a deal to build a factory in China, which incidentally is happening right after they got a huge capital infusion from major Chinese company TenCent (TNCT). It should not be lost on people that China has a massive pollution problem too. If they continue to sell tens of millions of gasoline powered cars, it will only get worse. I believe that we will hear the announcement from their government relatively soon that all of their cars will also be electric by 2030 or maybe sooner. I’ll also allow for some hybrids. What that means, is that with China and India largely going EV in the next decade or so. The mass adoption of EVs and hybrids around the world, we already know that Europe is pushing too, will mean even more efficiently produced, i.e cheaper, EVs and hybrids. 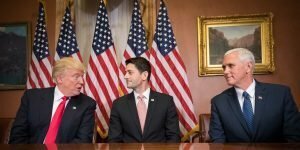 This will have a massive impact in the U.S. which is more free market driven and price reliant. As I said in a recent interview with David Moadel, there will be a press release soon, I think from Tesla, but it could be from any company and it will read like this: “We now have electric vehicles that go 400–600 miles on the charge, cost the same as gasoline powered cars, take less than half the maintenance and drive themselves.” When that PR comes, not if, it will mark EVs outselling gasoline powered cars very quickly. If America really wants lower OPEC imports and ultimately freedom from OPEC oil imports, we will follow the same trend that India and China are trying to implement. I think we will. And, I think the adoption rate will be higher than expected because the press release I am expecting will happen in the next several years. The Paris Climate Agreement, which 196 nations are in agreement on, excluding the U.S. at the moment, lays out a path to reducing greenhouse gas emissions. One of the core policies will be to build a lot more solar energy production. Again, China and India are pushing on this, as are Europe and Japan. Despite U.S. political resistance on the Republican side of the aisle, domestic corporations and many states have pushed ahead on solar deployment. While the U.S. does not use much oil for electricity generation, it is important to consider solar because there will need to be a lot more electricity needed for a future with EVs and plug-in hybrids. The development of a very EV and hybrid fleet does largely depend on the adoption of solar power generation. 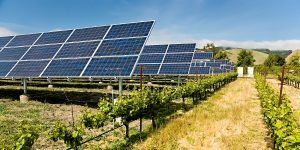 Solar is in fact growing the fastest of any new energy source The EIA just showed that the cost of utility-scale solar resources declined 21% from 2013 to 2015. The cost decreases are continuing. 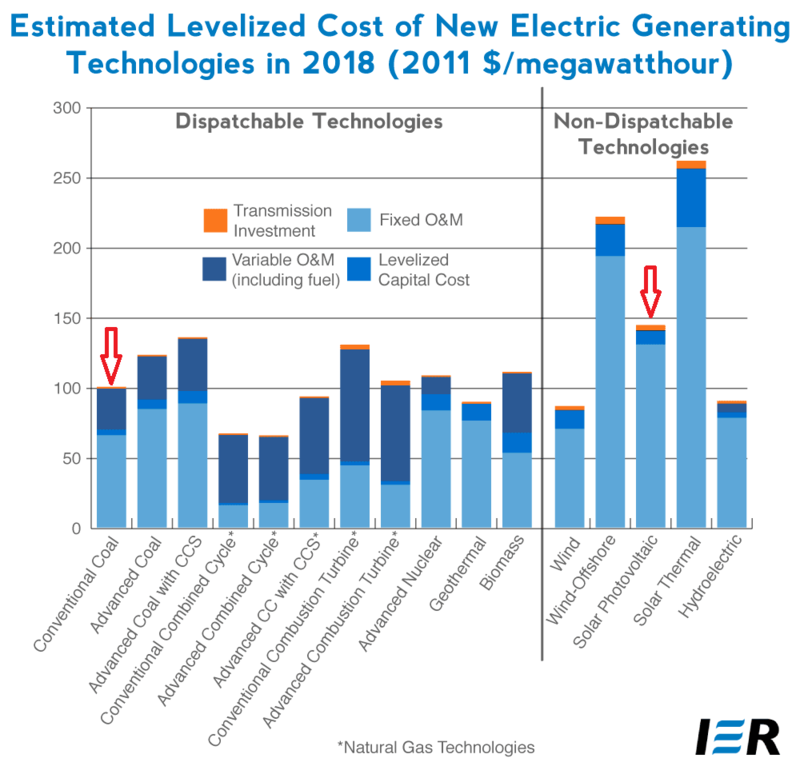 For brand new power generation, not replacing anything, solar PV has nearly reached parity with constructing a new coal power plant and is fast approaching the costs of building a natural gas plant. So, because solar is rapidly approaching grid parity in many places, we will be able to support the power needs of a new EV and hybrid fleet as it develops with continuing technology improvements in solar. You can see on the chart below from the Institute for Energy Research, it won’t take much more improvement from solar to be a leading source of power generation. Storage is of course a problem, but if you have been following the headlines, you are seeing massive batteries deployed, of different types, starting to fill the storage gap. When looking below, consider that as the price of coal or natural gas goes up, which it does over time even if the short run price is lower than the recent past, that solar gains in that regard as well. 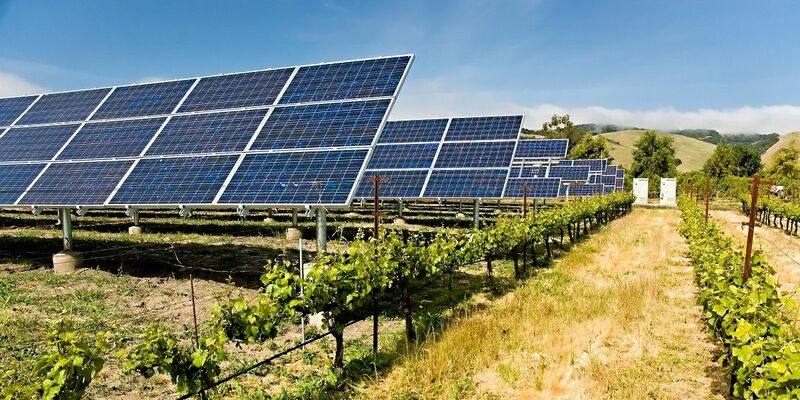 The idea that investors must embrace, is that as government policy reflects climate change, even if it is greatly de-emphasized in the U.S. at the moment, and technology makes solar more competitive, the advancement of solar will also drive EV and hybrid adoption. 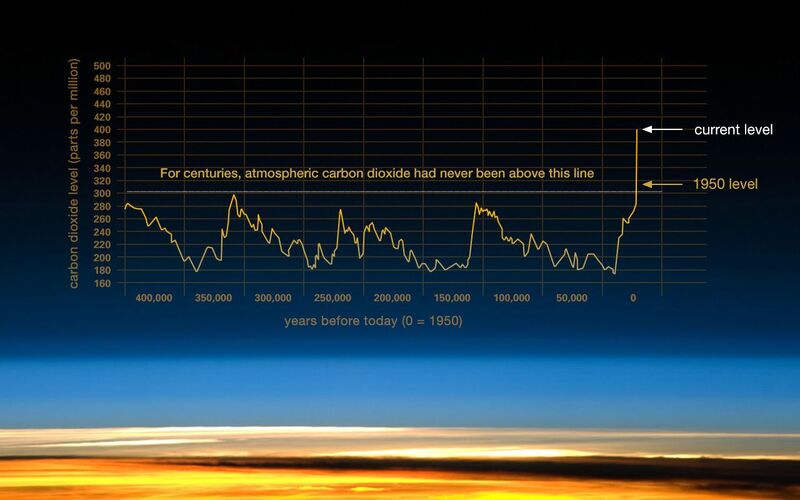 We are within several short years of that happening based on current trends. If those trends accelerate, as is apt to happen with technology, then the adoption pace could accelerate as well. That is vitally important to reducing our need for OPEC oil imports. In what is a side note for this article, the need to use petroleum based products for plastics is about to get wiped out too. 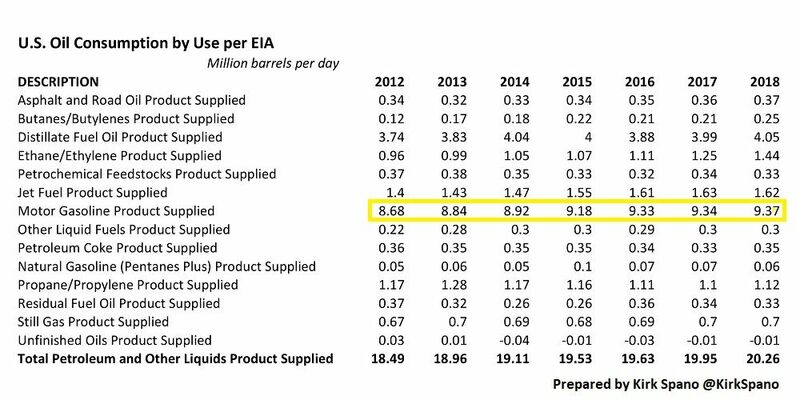 That amounts to about 4% of all oil demand or about a million barrels per day. There is a new cost effective technology that converts waste methane, from farms, waste facilities, dumps and natural gas power plants into plastics. Coca-Cola (KO) is already using it. It will be more widely commercialized imminently as private funding of the company that owns the technology has already begun. There is yet another reason that EVs might adopt more rapidly leading to our ultimate freedom from OPEC, the price of oil could rise substantially in the next few years.I believe that it will due to a pair of core reasons. The first is purely economic. 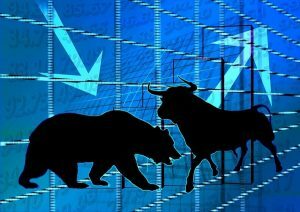 Oil supply and demand are already in balance and once the inventory of oil comes down, the price will go up. Oil inventory will fall in coming years because investment in deep water oil megaprojects has fallen off a cliff and will never scale that mountain again. There will be some offshore development of smaller and more economic projects that are cherry picked, but the deep water nine or ten figure developments are mostly lost to the past. I recently wrote an article titled “Deep Water Drillers Are Doomed Even If Oil Prices Surge.“Deep Water Drillers Are Doomed Even If Oil Prices Surge.” The simple reason this is true, is that many banks and even the shareholders at companies like Exxon (XOM), believe that financing most deep water projects is uneconomical. They realize that EVs and hybrids are coming and do not want to risk that adoption is faster than many anticipate, because they might not recover their investment in an expensive project. Ironically, that lack of drilling in turn will ultimately raise the price of oil. The other reason we might see higher oil price is of course war. I laid out an argument that the Missing Risk Premium Could Lead To Oil Price Shock. I laid out that disruptions to oil supplies could exceed 2 million barrels per day and that inventory drawdowns could rapidly, within a few months, create a situation where there was no excess oil supply. Unfortunately, I believe there is a near 100% chance that there will be a war with or within Iran by the end of the decade. The financial result will be more expensive oil. The real cost will be much higher. I tried to keep this shorter than recent letters and let the pictures do a lot of the talking. As I covered in last year’s Freedom Letter, the future is coming fast. The massive shift to EVs, hybrids and alternative energy will be among the big changes. We can choose to ignore it or deny it, or, we can embrace it and find the opportunities. I am choosing to embrace it realistically and find the opportunities.